Why in the world would anyone want to get into a PR war with Michael O’Leary? Who’s next, Richard Branson? Meridiana will have much better luck airing this in court rather than the press. A loss-making Italian airline has become embroiled in a war of words with Ryanair after blaming “unfair competition” from the Irish carrier for its decision to axe two local flights to Bari. 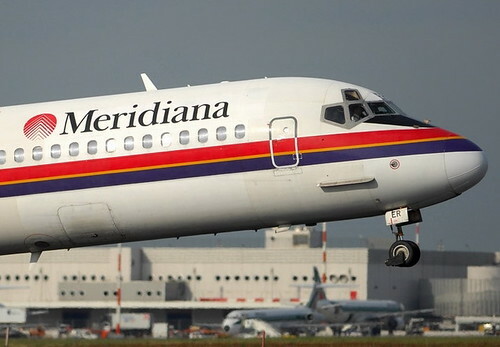 Meridiana-Air Italy said it was stopping its Verona-Bari and Milan Linate-Bari services from Sept 16 in protest at what it claimed was Ryanair’s misuse of discounts on landing charges from local airports. A Meridiana plane. Photo by Pietro Zanarini. The Italian airline formed from the recent merger of two local carriers alleged that Ryanair was using the discounts to subsidise domestic flights rather than develop international routes as promised. “Meridiana-Air Italy will verify the competitive conditions in each single airport. Should it find distortions, it will immediately axe the connection,” the carrier said. Its comments got short shrift from Ryanair chief executive Michael O’Leary, who noted its Italian rival had just posted €60.9m (£48m) losses in the past half year following pro-forma losses of €111m last year and €105m in 2010. “The problem is they have a high cost base and can’t compete with us,” he said. “I think they have already claimed we are responsible for civil war in Syria and famine in Ethiopia. He said Ryanair was increasing its frequencies on the Bari-Verona and Bari-Milan Bergamo routes, with its lowest fare of €18 far lower than Meridiana’s €53. Michael Cawley, Ryanair’s deputy chief executive, claimed Meridiana was itself “highly subsidised” as well as “perpetually loss-making”.